Accidents often occur as a result of a dangerous condition, and dangerous conditions can be found in many different types of places. Here’s a common scenario. You’re walking down the aisle of your local supermarket, the same place you go nearly every week. You’re not doing anything unusual, and not acting in an unsafe manner. You feel your foot slip, and you’re on the floor. Not only are you embarrassed, but worse, you feel a “pop” sensation in your knee, or maybe hear or feel a bone break in your ankle. It’s clear that you have sustained a serious injury. Fall down accidents comprise a large percentage of our practice, so call the White Plains accident attorneys at Worby Groner Edelman if you’re involved in this type of accident. The law involving fall down accidents is more complicated than you might think, and is very dependent on the exact facts of the case. No one can ever plan their immediate reaction, but it can pay to remember the specific facts involving your accident. First, it’s crucial that you know what caused you to fall. Was it a foreign substance, such as water, or grease or other type of debris in a food store? If you were outside, was it some irregularity in a parking lot, like an uneven ground? Cases where an injured party is unable to say what he or she fell on are often dismissed. Try to take the time to figure out what it was that caused you to fall. Next, it’s not sufficient to argue that whatever it was that you slipped on should not have been on the floor (or on the ground outside) in the first place. In a supermarket case, for instance, you have to be able to prove that the store had notice of the dangerous condition. There are a couple of different ways to prove notice. You can show that the store actually knew about the dangerous condition on the floor (called “actual notice”), but that’s very difficult to prove. You can also prove that the condition existed for such a long period of time that the store should have known about the dangerous condition (called “constructive notice”). If you slipped on lettuce in the produce aisle, what was the condition of the lettuce? Was it clean, which would tend to show it had only been on the floor for a short period of time, or was there grime, or dirt in it, or was it torn up, all facts which would tend to show it had been on the floor for an extended period of time? If you fell on some type of oil, or salad dressing, was there grease within the spill, or were there footprints, or shopping cart wheel marks? Those facts would also tend to show that the substance had been on the floor for more than a short period of time. Try your best to make note of these crucial facts. While it’s certainly true that the floors should be in a clean condition – and obviously food products should not be on the floor – it’s also true that the store is not responsible to clean up something that had only been spilled or dropped a minute or two earlier. The same laws apply to outdoor accidents too, such as loose steps on an exterior stairway, or cracks on a sidewalk. Those topics involve their own set of complexities, and will be covered in a future blog post. 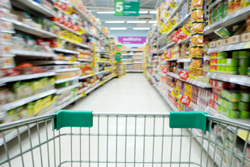 Companies that insure supermarkets and the attorneys who represent them use any possible defense to avoid liability in fall down accidents. Contact the White Plains accident attorneys at Worby Groner Edelman if you’ve been injured in a fall down accident. We have years of experience in handling this type of case. We’ll answer your questions, and process your case quickly. We’ll make all attempts to settle your case, and simultaneously prepare the case for trial if the insurance company refuses to settle for what we believe is a proper number. There’s never a fee unless we recover money on your case.